Christina Casurella, Jersey Mike’s Director of Operations; Rosemary Dworak (YMCA Healthy Living Center at North River), Tripp McCallie (YMCA of Metropolitan Chattanooga), Princess Snyder (Cleveland Family YMCA), Lee Montgomery (Hamilton Family YMCA) and Elliott Washington, Jersey Mike's crew member. Last week, representatives from Chattanooga Jersey Mike’s locations presented the YMCA of Metropolitan Chattanooga with an $11,034 check as part of the restaurant chain’s annual Month of Giving. The campaign culminated on March 28 of this year, when 1,360 Jersey Mike’s restaurants, including those locally in the Chattanooga area, donated 100 percent of sales, not just profits, to more than 170 different charities across the nation. The partnership between the YMCA and Jersey Mike’s is in its third year. Both organizations’ mission involves bettering the communities in which we live and positively impacting lives. 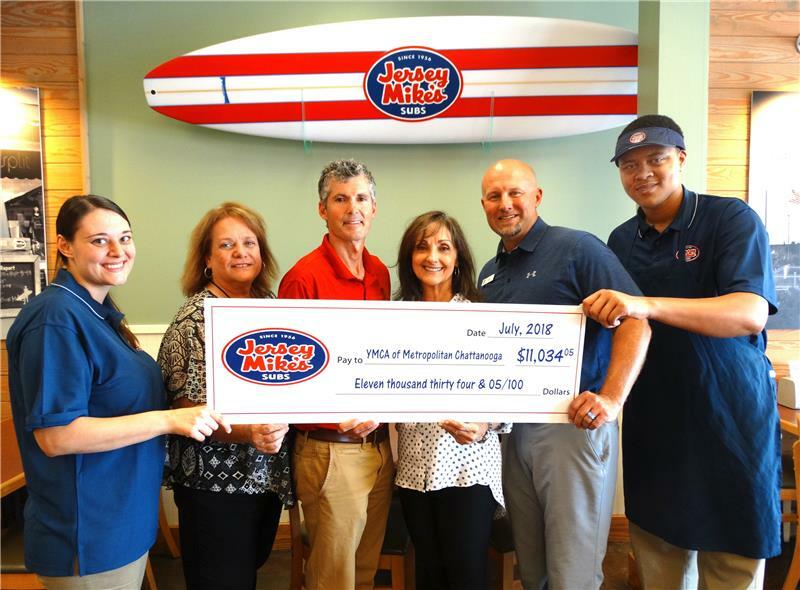 The money presented by Jersey Mike’s to the YMCA will go towards the association’s annual Community Support Campaign, which raises nearly $1 million annually.